TONY BLAIR and Gordon Brown stood shoulder to shoulder at the annual TUC conference in Brighton last week to defend the interests of global big business against the working class and to attack trade union calls for greater trade union freedom. Gordon Brown addressed the conference on Tuesday and Blair spoke in the evening at the annual TUC dinner. They both made it quite clear that whichever of them is leading the government, now the unions have done the job of getting them re-elected for another term, they are no longer needed and should just shut up and accept whatever big business wants. 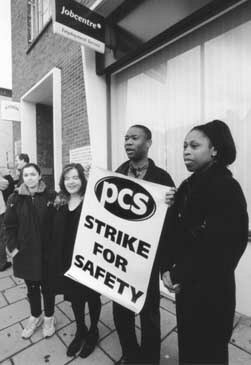 The remarks came in response to a unanimous emergency TUC resolution calling for the repeal of Tory anti-union laws – and in particular the ban on solidarity action. A few days before the TUC conference, a number of union leaders were demanding that Blair make clear his timetable for stepping down from the premiership – presumably in favour of Gordon Brown. Derek Simpson of Amicus was more blunt. He told the press that “Blair must go before he gives Britain a migraine”. He accused Blair of dumbing-down the economy by allowing skilled, full-time, well-paid jobs to be replaced with part-time, poorly paid unskilled work. And it seems that potential future clashes with a New Labour government are a major factor in his motivation for pressing for the creation of a “super-union” by a merger of Amicus with the TGWU and GMB. The “big four” unions – Unison, Amicus, the TGWU and GMB – have already made it clear to Brown that he should not expect a “coronation” as Labour leader. He did offer, as a sop, a pledge to bring in new legislation to honour last year’s nebulous Warwick agreement – but this cut little ice with the delegates, who gave him a very cool reception. Brown spent a large part of his speech detailing the growing proportion of consumer commodities that China supplies to the world – arguing that workers’ rights would have to take second place to facing commercial competition from the East. He forgot that the Chinese government and economy are the product of a workers’ revolution and that the capitalist development of China’s economy is taking place under the control of a workers’ government. In China trade union rights are being extended and enshrined in law and this is not making the country any less competitive. It is the avarice of the bosses which is kept in check and the economy still thrives. Driving the working class down into poverty, taking away our rights to organise and to stand by each other in time of trouble will not make Britain strong and competitive. Market economics can only ever serve those who have money to buy. If we really want to emulate China’s economic miracle, we will have to start with a workers’ revolution and begin to build socialism. THE CONTINUOUS low level of “loyalist” attacks on nationalist communities in the north of Ireland last weekend erupted into extreme violence and rioting. Gangs of “loyalists” have attacked the police – spurred on by paramilitaries who inflame their communities with the lie that nationalist communities are somehow doing better and getting economic advantages from the peace process. It is akin to the lies put out by the British National Party in some areas of England that Blacks and Asians are somehow getting more investment and resources than the white working class. It’s the age-old tactic of using ignorance and envy to divide and rule. The truth is that in the north of Ireland it is the IRA, Sinn Féin and the nationalist community who have made concession after concession to try to keep the peace process alive but who have yet to get even a sniff of access to basic democratic procedures they were promised in the Good Friday Agreement (GFA), because the various Unionist leaders are obstructing the reconvening of the Northern Ireland Assembly. All the communities of Ireland, north and south, unionist and republican, backed the GFA as a way to end violence and resolve differences through political processes and all made concessions to achieve the agreement. Now the loyalist leaders describe the agreement as some sort of republican plot. So long as that assembly remains suspended the working class of both communities have little access to any kind of democracy on any issue. This includes health, education, social services, employment policy and so on, making them more vulnerable to exploitation. The loyalist thugs only get away with this level of violence because the state – the police, the army and the Westminster government – are happy to let them. Westminster is eager to threaten and deport Muslim fundamentalist preachers but they are content to allow the Reverend Ian Paisley – who once openly organised his own paramilitary – to continue to preach hatred and violence.